Acta Reumatólogica Portuguesa is a scientific peer reviewed journal covering all aspects of rheumatic diseases and related to Rheumatology. The journal publishes original articles, reviews, clinical cases, images in rheumatology, letters to the editor and clinical teaching (e.g. guidelines and clinical protocols). 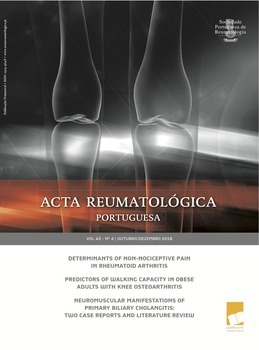 Published since 1973, Acta Reumatológica Portuguesa is the official scientific publication of the Portuguese Society of Rheumatology, a non-profit organization that promotes the knowledge and investigation of rheumatic diseases and the development of Rheumatology.